When country music star Crystal Gayle went to London to shoot her guest spot on The Muppet Show, she was both a singing sensation and well known for her television appearances. Her enormous hits “Don’t It Make Your Brown Eyes Blue” and “Talking in Your Sleep” along with her distinctive cascading hair made her instantly recognizable on both sides of the Atlantic. A self-proclaimed Muppet fan, Gayle’s appearance was probably also influenced by what was no doubt a good report from her sister, country singer Loretta Lynn, who had starred on the show the year before. Clearly, word had gotten back to the entire family, and their mother accompanied Gayle on her trip to England for the taping. Both sisters worked with the Muppets again, performing on the 1981 album Sesame Country. On The Muppet Show, Gayle got to sing her hits “River Road” and “We Must Believe in Magic” (with an array of magical characters), but the real action took place backstage where the Prairie Dog Glee Club was wreaking havoc pursued by Fozzie in his role as Bear on Patrol. The Prairie Dogs were stealing everything not nailed down, leaving the cast to say their “good nights” in their underwear. The episode also contained a memorable “Pigs in Space” sketch featuring a nod to Star Wars in the guise of Gonzo’s portrayal of Dearth Nadir. 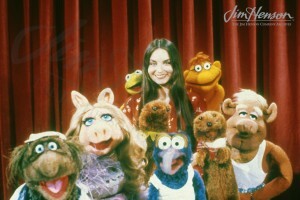 Crystal Gayle and her underwear-clad friends on The Muppet Show. This entry was posted in 05-May '79, 1979, Muppet Show and tagged Bear on Patrol, Crystal Gayle, Dearth Nadir, Fozzie, Gonzo, Loretta Lynn, Pigs in Space, Prairie Dog Glee Club, Star Wars. Bookmark the permalink.